3D Tour! Prepare to be impressed w/this fabulous custom built 2-bedroom + Bonus Room, 2 bath home, with 2 car + a golf cart garage/workshop, located in the highly desirable community of South Gulf Cove. 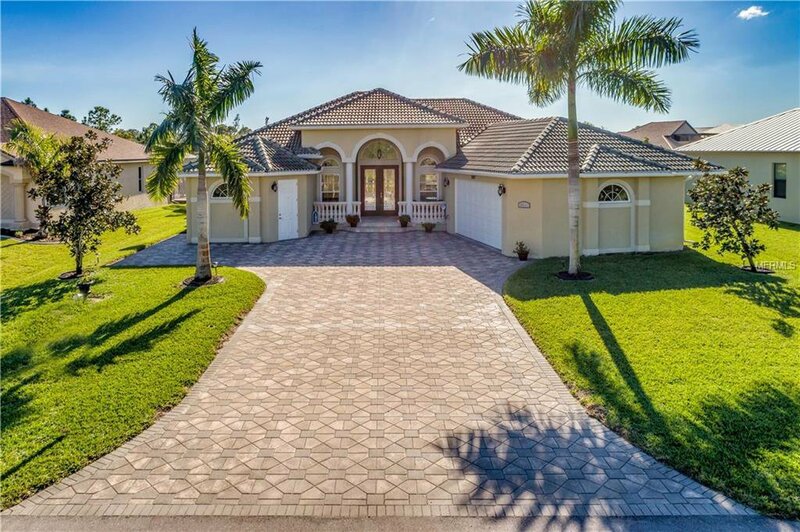 Pull into the brick paved driveway & be greeted w/tropical landscaping & a grand front entrance w/columns & Tuscany baluster railings & travertine floors. Open the double etched glass doors & be met with a large great room with spectacular waterfront views, 10' tray ceilings, 20” porcelain tile throughout, cozy reading corner & stacking sliding doors w/easy access to the private lanai & pool area. Gourmet kitchen has wood cabinets, granite counters, SS Appliances, closet pantry, plant shelves, under & over cabinet lighting, breakfast bar & gorgeous tile backsplash. A sunny breakfast area overlooks your pool & canal through the aquarium style windows w/decorative box beam coffered ceiling w/electric for rope lights. The remarkable master suite has tray ceiling, canal views, dual vanities, Roman Walk-In-Shower, Make-Up Vanity, Separate toilet stall & oversized walk-in-closet. This home features a media room, that could be a great office, kid’s playroom or Mancave! An inside utility room has Bosch washer/dryer, wood cabinets, granite counters & laundry sink. Relax & enjoy a cup of coffee or a good book on the spacious screened in lanai, grill out on the side deck, catch some fish from your brick paver outdoor patio area or soak up the Florida sun in your unique in-ground pool w/sun shelf! Make an offer today! Listing courtesy of RE/MAX ANCHOR REALTY. Selling Office: NON-MFRMLS OFFICE.